All we know is the recipe we tested certainly tastes like KFC. And whatever it is, it’s finger lickin’ good. Mix the flour in a bowl with all the herbs and spices; set aside. Mix the buttermilk and egg together in a separate bowl until combined. Soak the chicken in the buttermilk mixture at room temperature, 20-30 minutes. Remove chicken from the buttermilk, allowing excess to drip off. Dip the chicken pieces in the herb-spice-flour mixture to coat all sides, shaking off excess. Allow to sit on a rack over a baking sheet, 20 minutes. Meanwhile, heat about 3 inches of the oil in a large Dutch oven (or similar heavy pot with high sides) over medium-high heat to 350 degrees Fahrenheit (180 degrees Celsius). 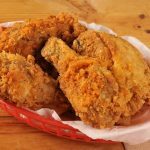 (Use a deep-frying thermometer to check the temperature.) When temperature is reached, lower the heat to medium to maintain it at 350. Fry 3 or 4 pieces at a time, being careful not to crowd the pot. Fry until medium golden brown, turning once, 15-18 minutes. Transfer chicken pieces to a baking sheet covered with paper towels. Allow the oil to return to temperature before adding more chicken. Repeat with remaining chicken. Sprinkle with MSG before serving. Yes!! MSG, THAT my friends is the secret ingredient. It wont taste th same without it. With the oil temperature just right at 350 degrees, the chicken soaked in buttermilk and coated just once in the breading mixture, we had our final tasting. How was it? Well, really good. 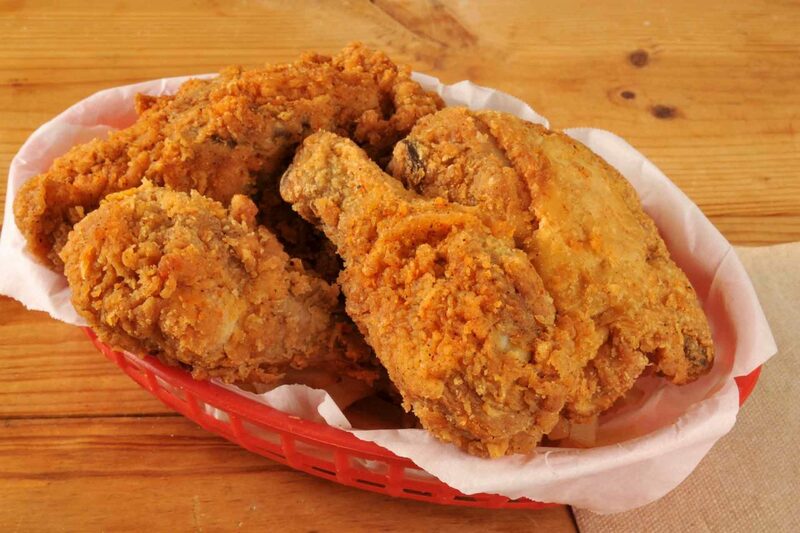 In fact, tasters agreed the test kitchen fried chicken was even better than the Colonel's.